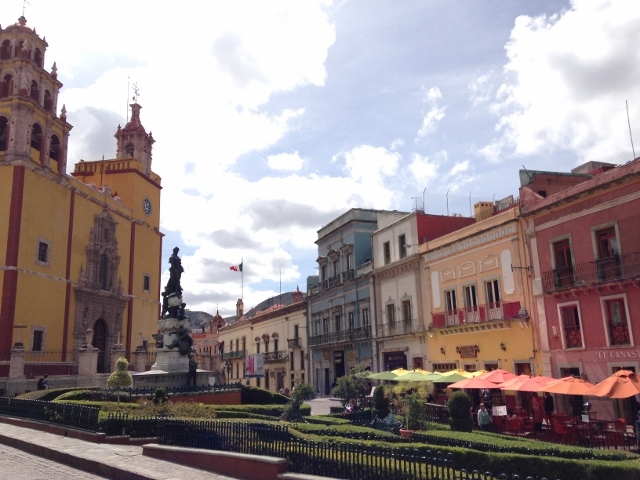 Guanajuato is one of the most picturesque cities in Mexico! 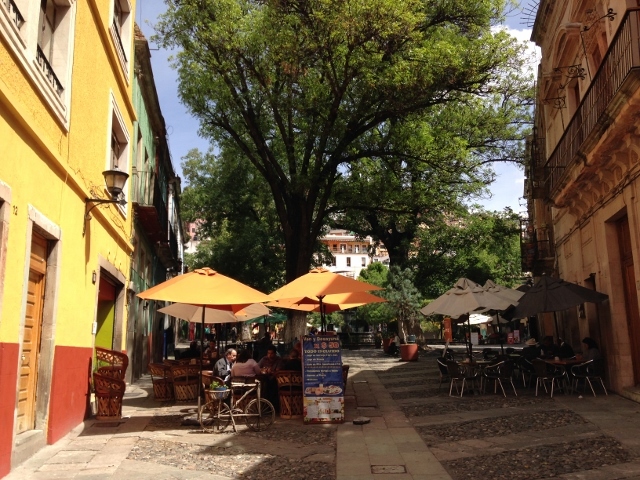 We took a day trip from San Miguel de Allende to discover Guanajuato, the capital of Guanajuato state, and found one of Mexico’s best kept secrets. 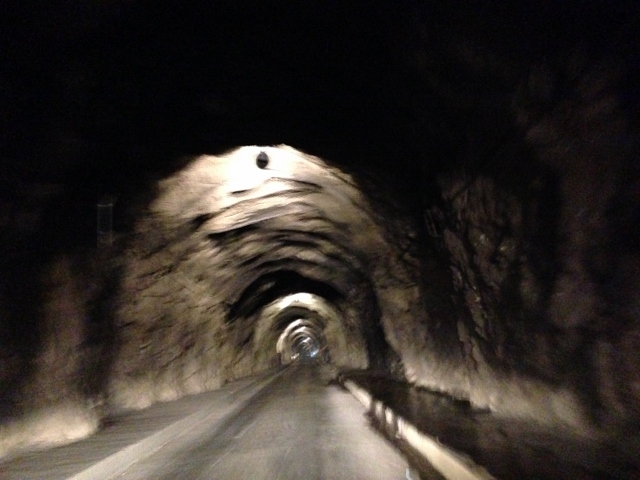 In order to reach this colonial gem, you need to first drive through a maze of underground tunnels. 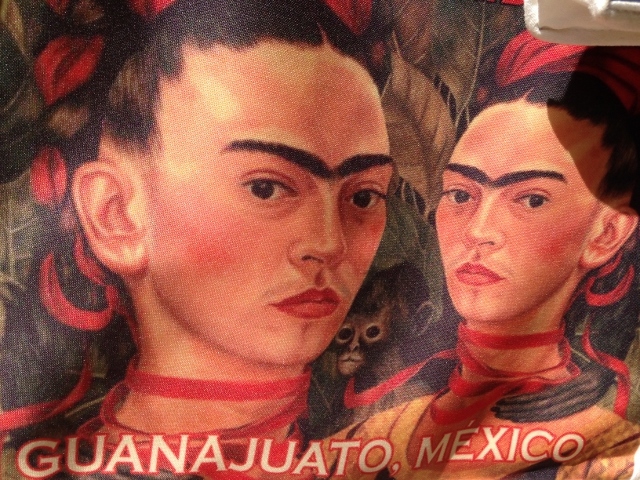 We’ve traveled the world, and never seen anything like this – AMAZING! Our guide, Tania Luna, shared that, “Guanajuato is nicknamed ‘the place of frogs’ because the shape of its mountainous terrain is said to have resembled a frog to the city’s early inhabitants. The region is known as the Bajio, or heartland of Mexico.” Surrounded by the Sierra de Guanajuato Mountains, and based in a beautiful valley, Guanajuato was known for its silver mines dating back to 1548. 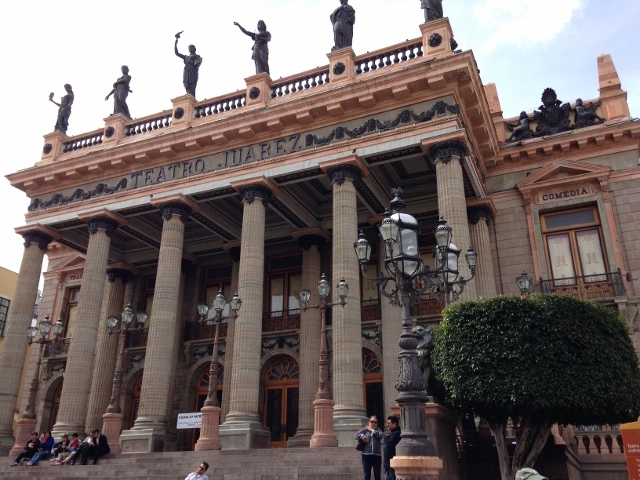 We met Tania at the Theater Juarez and walked through the center of the city on a 2 hour tour. 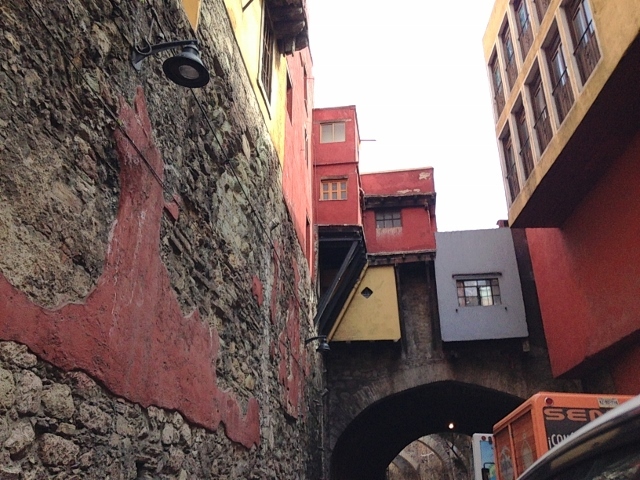 She took us through the narrow cobblestone alleyways (callejones), plazas, town squares, and showed us the historic monuments and neoclassical and baroque architectural style colonial buildings. 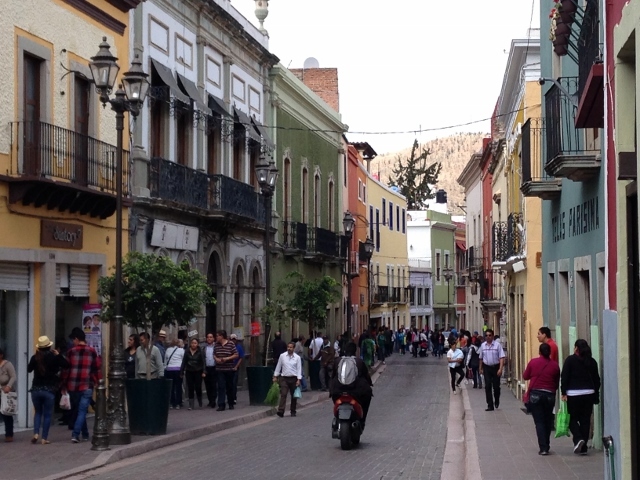 We listened to the mariachis sing at shady plazas, and strolled by sidewalk cafés, museums, theaters, markets. An authentic colonial-era city with European flair, and declared a UNESCO World Heritage Site a in 1988. Two hours wasn’t enough, and we recommend staying 1-2 nights. Below is a list of the highlights we saw during this tour. Be sure to take some time to sit on one of the park benches under a laurel tree and listen to the mariachis sing and play local music. This park is a central meeting place and was built in 1861. This neo-classical theater is the venue for the annual Festival Cerantino, the country’s top art festival, named after the author of Don Quixote, Miguel de Cervantes Saavedra. 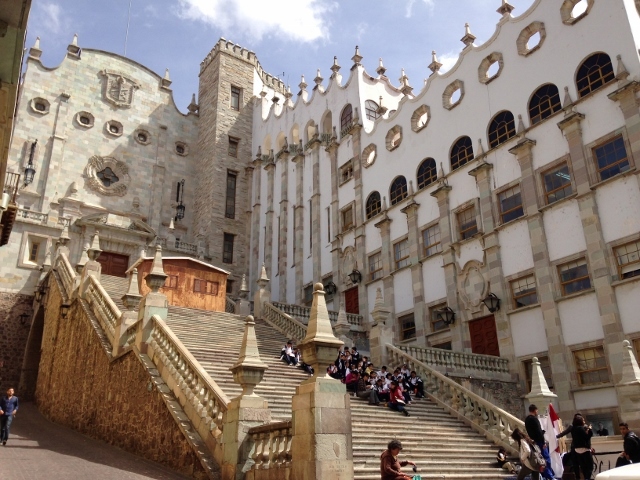 It’s one of the most lavish theaters in the Americas. Queen Elizabeth and other notable guests have visited and seen performances here. One of the oldest universities in the state that was remodeled in the Moorish style in 1945. 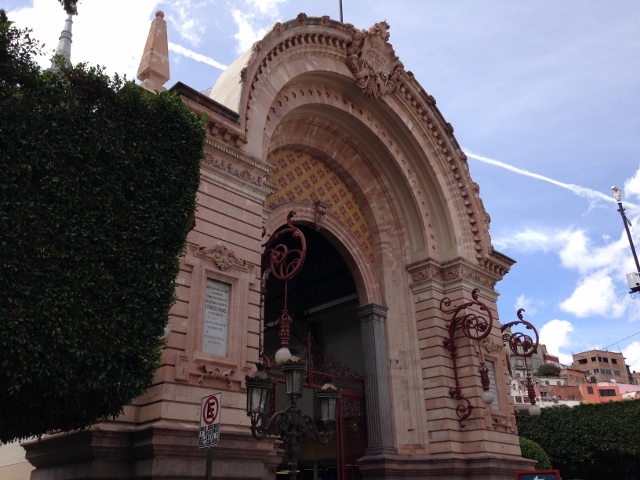 Guanajuato has a large student population, approximately 20% of the residents. 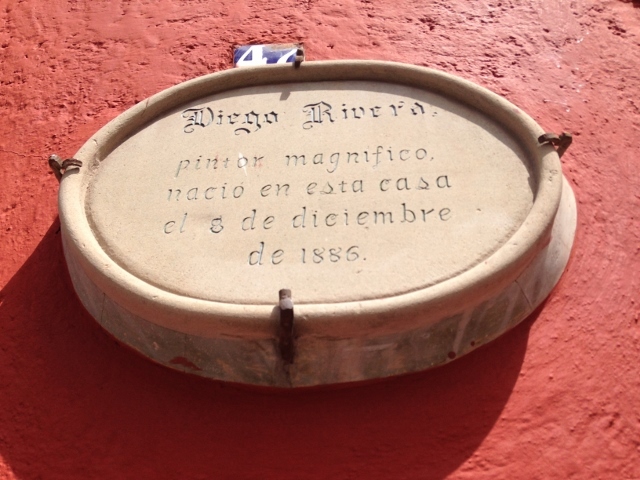 Visit Diego Rivera’s home that’s been converted into a museum. 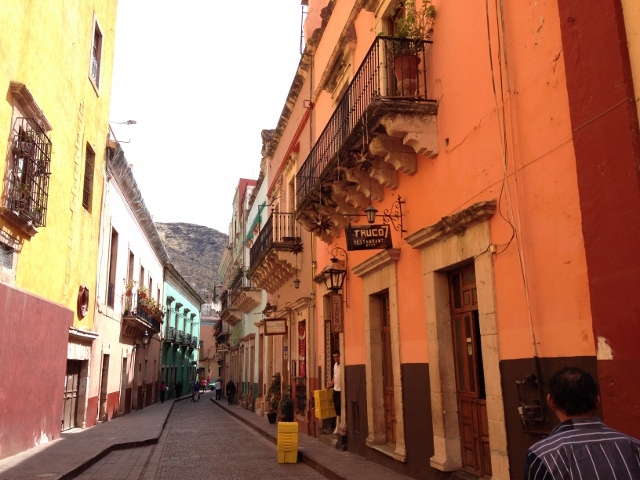 One of the most popular legends in Guanajuato originated from Kiss Alley (Callejón del Beso) when two secret lovers were caught kissing and fell to their deaths. This alleyway is about 2 feet wide and so narrow couples can kiss from balconies on the other side of the alley. We heard there’s a “walking serenade” called a callejoneada, where musicians serenade visitors and play guitars while telling local tales. 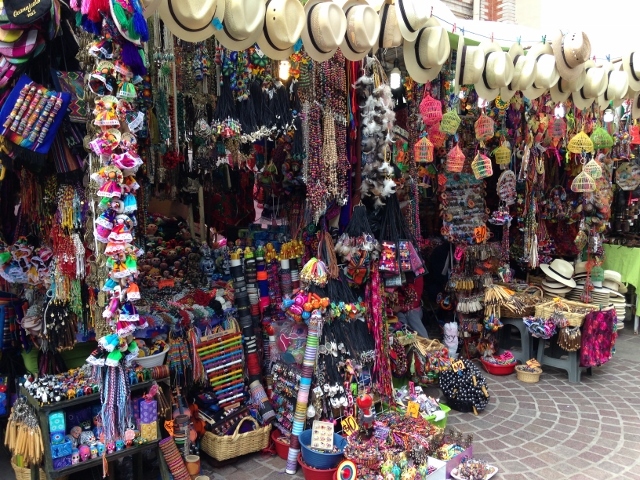 Located in a beautiful old building, we saw colorful handicraft stalls, and vendors selling their goods. 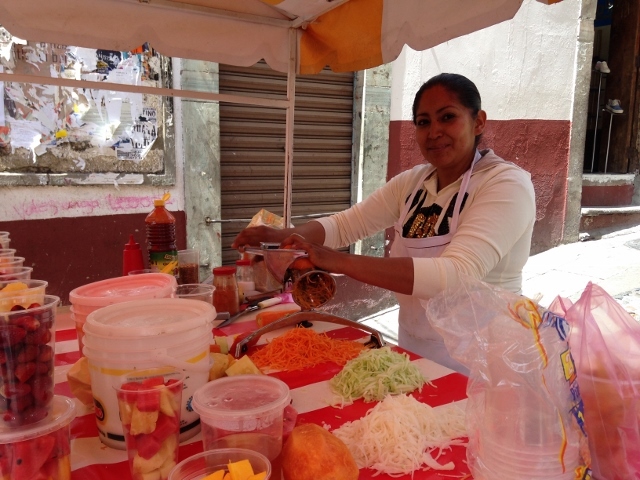 Sample the local sweets like trompadas and charamuscas. The central square where the Cathedral stands, surrounded by historical monuments, sidewalk cafes and shops. Get to know the town, and jump on the tram car tours named “El Quijote” that depart from the Plaza. Located in the center of the city is Alhondiga de Granaditas, an old granary, now historic building and monument that represents the birthplace of Mexican Independence. This is the site of the first major victory in 1810 over the Spanish. For a panoramic view of Guanajuato, head to the summit, Cerro de San Miguel, and visit the Pipila statue dedicated to the legendary miner who burned the door down to the Alhondiga de Granaditas that started the Independence War. 1. DK Travel Guides for the book on Mexico to help plan this trip. 2. 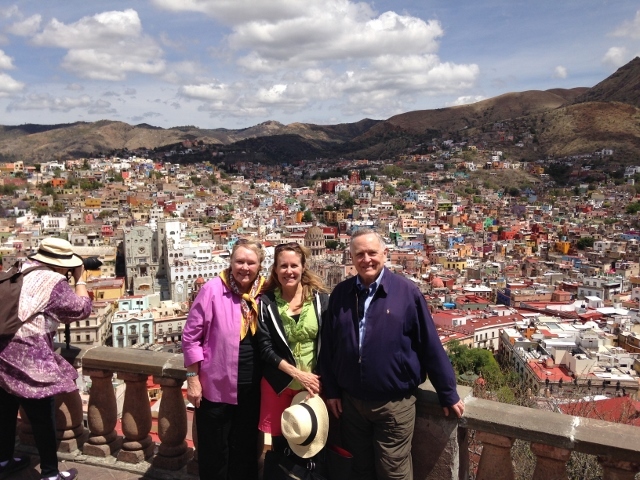 Guanajuato Tourism Board for hosting our tour of their beautiful city!